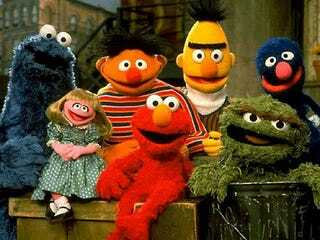 This year marks the 40th anniversary of Sesame Street. As Newsweek's Lisa Guernsey reports, although the children's show changed the world — intentionally showcasing children of different races living and playing together, and teaching kids about numbers and letters before they hit kindergarten — it's now number 15 in ratings. But while SpongeBob and Dora may rank higher, has any other show done so much for kids than Sesame Street? According to Guernsey, "Independent research found that children who regularly watch Sesame Street gained more than nonviewers on tests of letter and number recognition, vocabulary and early math skills. One study, in 2001, revealed that the show's positive effects on reading and achievement lasted through high school." Plus, unlike some other offerings in 1969, the show tapped into the social activism of the era. "From the start," writes Guernsey, "Sesame targeted lower-income, urban kids-the ones who lived on streets with garbage cans sitting in front of their rowhouse apartments." And there were other moments — like when Snuffleupagus taught us how to communicate with the deaf — which showed that the program attempted to include to all kinds of people. Singing, cultural diversity and huggable puppets: What's not to love? (How many of these albums did you have?) Next: Some favorite moments from Sesame Street! "Me And My Llama." It's probably best not to wonder why a little girl is walking a llama through the streets of Manhattan and instead think of this as a way to teach kids that the dentist isn't scary. Question: Does that llama also see an orthodontist? "Ladybug Picnic" It's not just a counting song: It mentions knock-knock jokes! And when they roast marshmallows, it seems like the most fun thing in the world. "School Pageant: Flower" Prairie Dawn plays piano in this hilariously crappy school play, where monsters are bad actors who forget their lines. "Pinball 12" The voices you hear are the Pointer Sisters. Enough said. "Ernie Can't Sleep" Since Ernie has insomnia, he clearly has to keep Bert awake as well. "I Love Trash" Did you know that Oscar used to be ORANGE? "Somebody Come And Play" Mommy! We have to hurry and visit the zoo! All the animals are so sad and lonely without us!!! "C Is for Cookie" A classic. Simple and to the point. "Near And Far" Grover — voiced by Frank Oz, who later played a cop in the Eddie Murphy/Dan Akroyd flick Trading Places, explains "near" and "far" here, but was also amazing in his segments with John-John. "Fairy Alphabet" Some really gorgeous illustration/animation; super '70s tune!